I try to put some goals down on paper every year: as you know, I’m a believer that writing them down increases my chance of success. Early on I knew that “Simplification” would figure in. I’ve talked about this before on my blog. And I’ve made some progress. I’ve been systematically paring down the items in my closet, for example, while trying to guard against leaving myself with only boring stuff to wear. And what does that mean? Well, for me it pretty much comes down to limitation. America is the land of plenty (though with the strange phenomenon of genericizing to the point that every town looks almost the same as every other town), and I admit I subscribed to the notion that more is better, not in thought but in action. 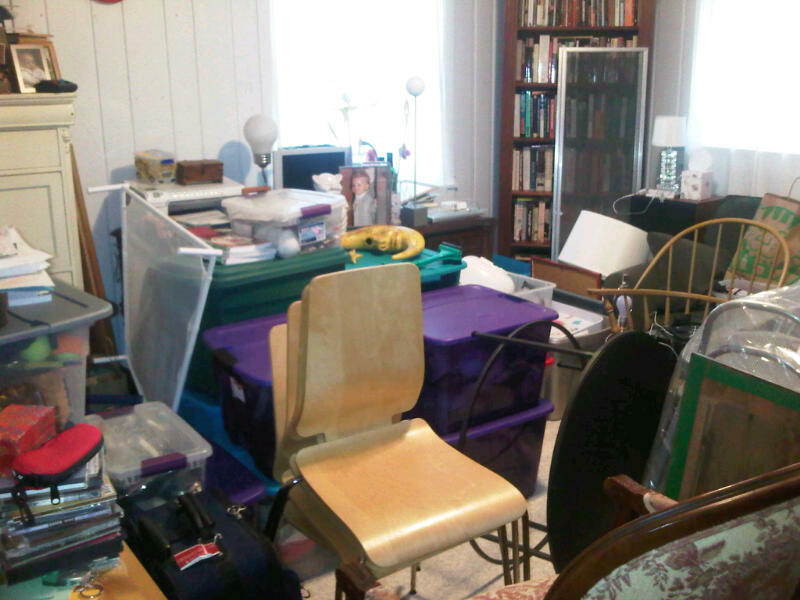 You can just look at the picture to see that I’ve acquired a lot of things (and you haven’t even seen my storage room). Especially when I travel, I always want to bring something home to remind myself of my trips. But it didn’t stop there. I have lovely glassware, for example. But they keep designing NEW glassware, slightly different than what I have. And tastes change as well. Maybe I don’t like some of my old glassware anymore. But all of this choice leads to all of this stuff. And the wealth of choices is not limited to material goods. There are so many activities, so many hobbies, so many restaurants to try, so many movies, so many books (though I draw the line at books – I hope to read as many as I can). There is so much opportunity that one can get lost in it, at least I can. It even happens to me at work. There’s a new acquisition, a new project. My mind starts racing. Should I try to get involved? That’s it, really. There are offshoots to this, of course. I love to travel, for example. But we’ve done a lot of traveling in the last four years, and most often our travel is something we decide to do for the fun it brings our family or that I do for my writing so, at least for this year, it stays off the list. I’m downsizing my job a bit. I’m moving to a more healthful, limited diet and am having my kids eat more healthfully too. I’m making writing my top priority activity outside family and work. If I have spare time, I spend it writing, learning more about the industry, participating in a writing group, attending conferences as necessary, and reading. These activities enforce my belief in myself as a writer and my ultimate success, which for me means having multiple books published and read. And finally, a happy home. I’m getting rid of stuff. My entry hall is going to be an ongoing temporary exhibit of items to be sold through Craig’s List, sent to an antique store, or donated. No more rooms full of stuff we don’t need. I’m renovating so our house works better for us, so we avoid feeling like we need to move, which would in the end be more expensive and disruptive. With the renovation complete, I’m concentrating on financial security. Less money spent day to day, more money to save. That’s it. And now, it’s time for me to work on my new novel. Only about 75,000 more words to go. Dang, girl –you’ve got a lot of goals for the year wrapped up in that one big one. 🙂 I totally need to take a cue from you and start de-cluttering my house. And simplifying in general. Best of luck finishing your new novel this year! I hope it proves to be an awesome year for writing. Ha, you got me there, Erin! I guess I can’t really boil my year down to only one thing after all. 🙂 Of my bullet points, I have to say that decluttering is one of the most important ones to me. And of course it also means we have to stop bringing so many new things into the house too. After the remodeling project I’m hoping that only a fraction of what was in the space previously finds its way back in. I think I’ll be posting on Craig’s List for quite some time. Best of luck for your writing this year too! Let’s toast to this being THE YEAR!! Wonderful resolutions, Kristin. I think it does us all good to sit back and focus on what is important in our lives. Thanks for sharing.